What a week! Laryngitis which turned in to sinusitis; four games of golf in five days during a trip to Ireland; a visit to the Guinness factory and a performance of Cirque du Soleil. One thing topped it all for me, however. On Sunday Becky Morgan, a 44-year old from Abergavenny in Wales, won her maiden professional tournament after grafting on the main tours of the world for 18 years. 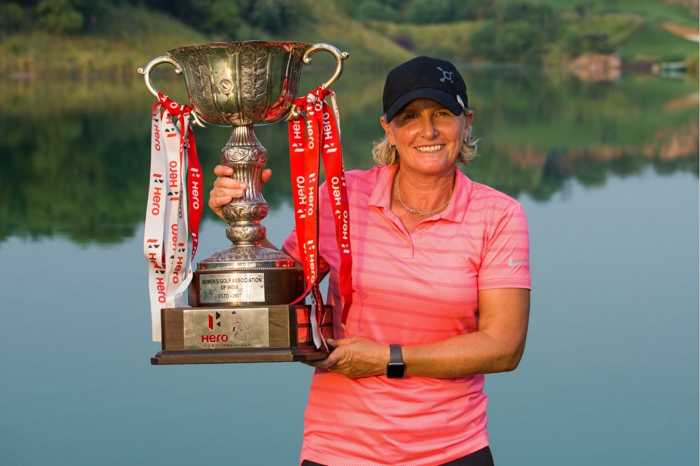 She captured the Hero Women’s Indian Open, a tournament she has been a faithful supporter of since its inception in 2010, by two shots from a gaggle of players, including the resurgent Solheim Cup Swede, Caroline Hedwall and Englishwoman Felicity Johnson. For those of us whose paths have crossed with Becky over the years there will only be one reaction – sheer delight for the unassuming, low-key player with a fine line in understatement and droll humour. Widely recognised for some time as the best player not to have won a title Becky was beginning to wonder would she ever provide that exclamation point to her career. We spoke last year and she said, “If you’d told me before I turned pro that I would do what I’ve done, I would hardly have believed you. But then after two very good years in 2003 and 2004 I am disappointed not to have won a tournament. I still feel I can win but my best opportunity now would be in Europe.” Recognising this fact prompted Becky to increase her appearances on the LET schedule which has given her one of the longest commutes to work that I know of. She is currently living in Portland, Oregon – so that was a helluva trip back home after her victory. It did, however, afford her the time to catch up with her social media accounts and she was thrilled to read one from the inimitable Gary Player. You know you’ve arrived when you receive one of these…..
We live in a world of seemingly instant success, instant stardom and instant achievement. That is what many value these days but it’s not the only way. Becky has had a solid, honest, hard-fought-for career, painstakingly put together over two decades with resilience and stickability at its core. That refusal to be bested, the dogged determination to stay in the game, the steel that is relentlessly honed in the heat of battle and the lessons learned with each disappointment are the components that finally added up to this fine, fine, and oh-so-popular win. My golfing pals and I raised a glass to the Welshwoman last week and I look forward to next year’s Women’s British Open at Woburn where we can raise a glass together – slainte Becky! From one Welsh player to another and Amy Boulden, who is currently embroiled in a marathon tussle out at the legendary Pinehurst resort in North Carolina in a bid to gain a card on the LPGA for the 2019 season. Earlier in the season Amy told me she was filling her schedule with as many playing opportunities as she could, including taking part in as many corporate outings as possible. The reason was two-fold – play as much as you can and save as much as you can with a view to an assault on the qualifying process for the premier women’s tour in the world in the autumn. Well, the time for that assault has arrived and Amy couldn’t have got off to a better start, jointly topping the field at Stage 2 Qualifying in Florida with a score of ten under par. That has advanced her to the newly minted Q-Series rolled out by the Tour this year, where, numerically at least, the odds are pretty decent. The full field is 108 players with the top 45 and ties earning a precious LPGA card for next season. The rest of the field will be afforded status on the secondary Symetra Tour, so it looks like Amy will be stateside next year in some capacity or other. The marathon tussle I referred to is just that. Two four-round, no-cut tournaments with a three-day break between the end of one and the start of another. The score is cumulative throughout the eight rounds, a real test of skill, stamina and mental fortitude. Friends and family at home will be following every live scoring update, as will I. It’s a nervewracking time for all concerned but this is a big opportunity for Amy. I wish her well. Time for another dragon to roar.